Hawaii Native Status: Introduced. 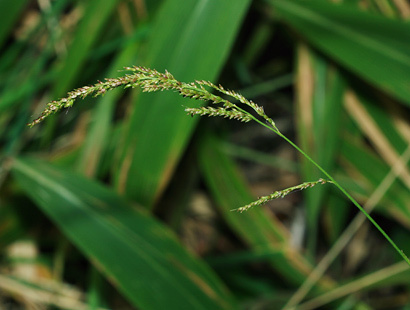 This naturalized ornamental grass and food plant is native to Asia. Description: The single-bristled flower spikelets are in lax, flexible, open panicles on tall, slender stalks. The flowers are followed by small, light brown caryopses (grains). 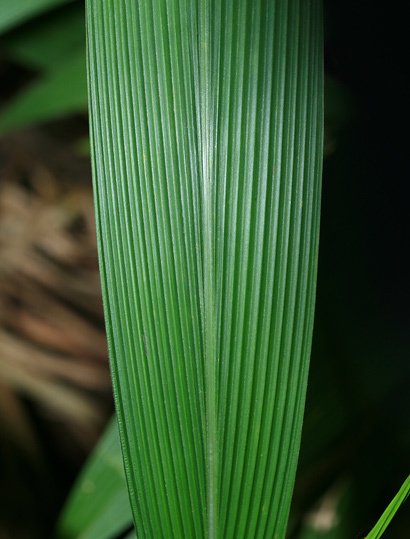 The leaves resemble those of seedling palms and have stiffly haired sheaths and large, green, plicate (pleated), fusiform (wide in the middle and tapering at both ends) leaf blades. The culms (grass stems) are erect and they emerge from a short rhizome. 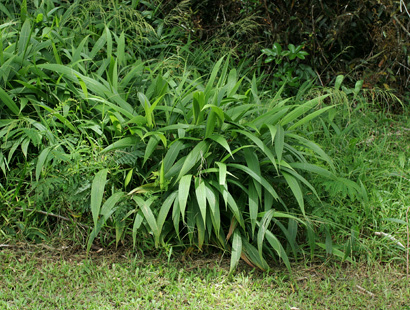 Here in Hawaii, Palmgrass is a weed in wet and mesic (moderately wet) forested areas from low to middle elevations. Edible – The young, unopened, sheath-enclosed flower shoots are edible, but they are much better in the cultivated "Pitpit" varieties of this plant, which are grown for food. The cereal grain is also edible, but it is small. Hawaii Native Status: Cultivated. 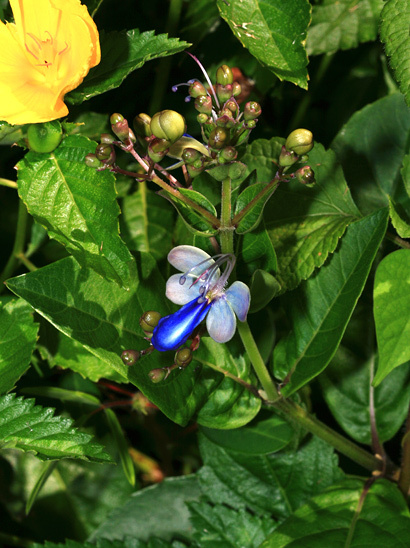 This ornamental garden plant is native to East Africa. Description: The butterfly-shaped, up to 1 inch (2.5 cm) wide flowers have long, curved stamens, 4 pale blueish white side petals and a longer, cupped, blue or violet lower petal. The flowers are followed by small, shiny, red to black, up to 4-lobed fruit. The variable leaves are green, opposite or in whorls of 3 or 4, and narrowly elliptic or egg-shaped. The upper stems are hairy or hairless and green to dark purple-red in color. The lower stems are woody and branched. The plants can be propagated by stem cuttings. Hawaii Native Status: Introduced. This naturalized weed and medicinal plant is native to Africa. Description: The plants are monoecious with separate male and female flowers on the same plant. The up to 1 foot (30 cm) long inflorescences contain both male and female flowers and are located at the stem tips. The small female flowers are located at the tips of the inflorescences and have red stigmas. The tan-colored male flower clusters are located at the base of the inflorescences. The female flowers are followed by clusters of spiny, rounded, trilobed, 3-seeded, green or red seed capsules that turn a dark red-brown color and explode open when dry. 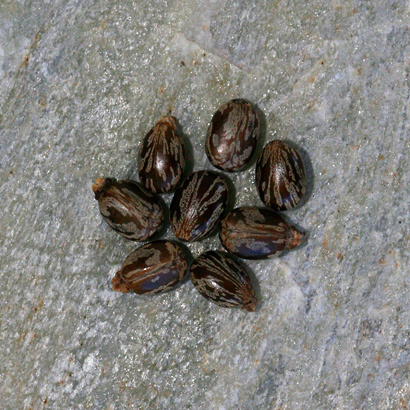 The shiny, grayish to beige seeds are mottled with dark brown and resemble spotted dog ticks in size, shape and markings. 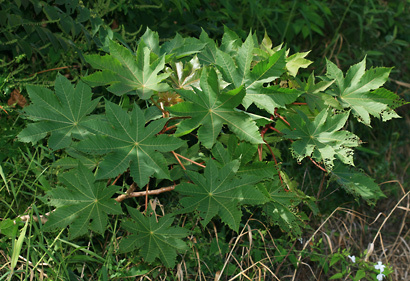 The leaves are large, prominently veined, green, purplish, or dark reddish in color, alternate, lopsidedly peltate with stout, reddish stalks, and palmately lobed with usually 7 to 11 point-tipped, sharply toothed lobes. 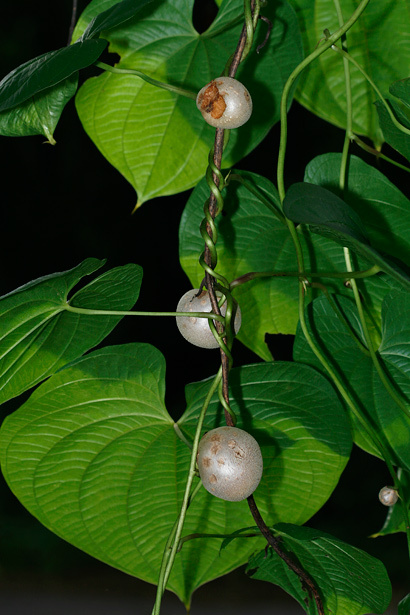 The stems are erect, branched or single-stemmed, hairless, greenish red to brown in color, hollow to pithy, and woody at the base. The plants are weedy and fast-growing. 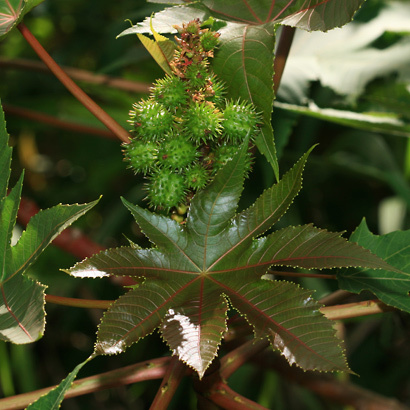 Here in Hawaii, Castor Bean grows in sunny, disturbed areas and along roadsides in dry to mesic (moderately wet) areas at low to middle elevations. 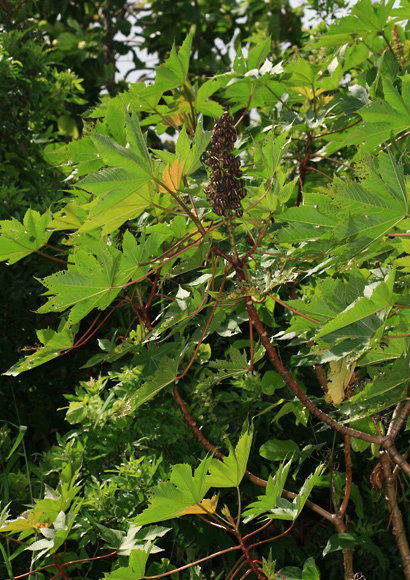 Edible – Castor oil, which is extracted from the oily seeds, is used as a laxative and as a labor-inducer. The non-yellowing oil is also used in cosmetics. Although the oil from the seeds is safe to consume, the seeds themselves are deadly poisonous and should never be eaten. Poisonous – The seeds are extremely poisonous to both humans and animals and should be kept away from young children and livestock. 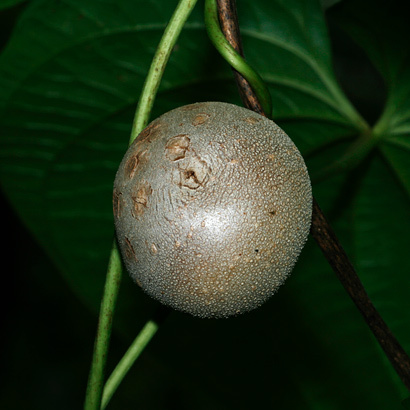 The seeds contain the deadly toxin ricin. 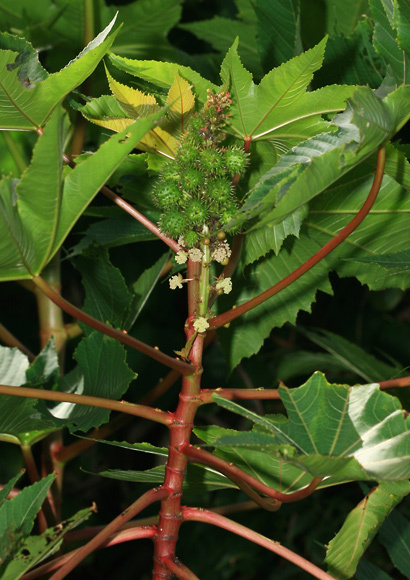 Castor Bean, along with Rosary Pea (Abrus precatorius), are two of the most poisonous plants in the World. 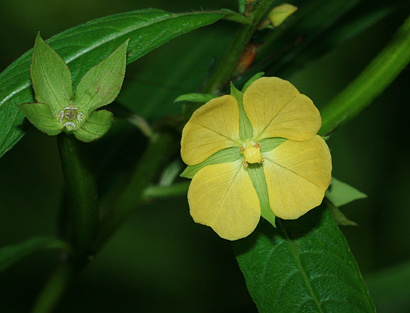 Description: The flowers emerge singly from the leaf axils and stem tips and have 4 broad, yellow, often notch-tipped petals and 4 green, lance-shaped or egg-shaped sepals. The flowers are followed by elongated, cylindrical, 8-ribbed seed capsules tipped with 4 calyx lobes (the former sepals). 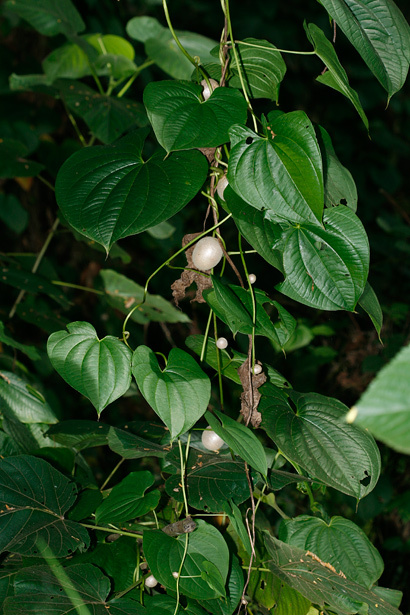 The leaves are green, alternate, and lance-shaped to narrowly egg-shaped. The stems are green to sometimes brownish and woody at the base, upright, well-branched, and variably hairy. 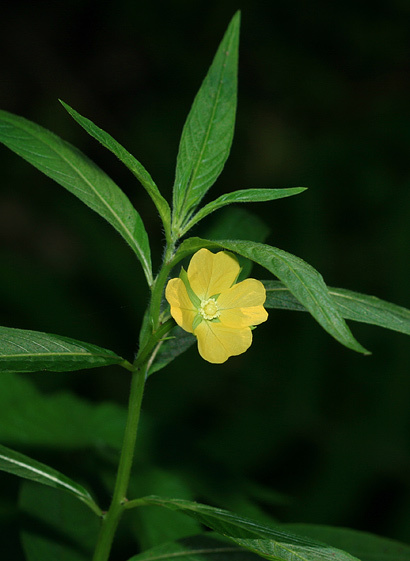 Here in Hawaii, Mexican Primrose-willow grows in wetlands and other moist areas at lower elevations. Hawaii Native Status: Introduced. 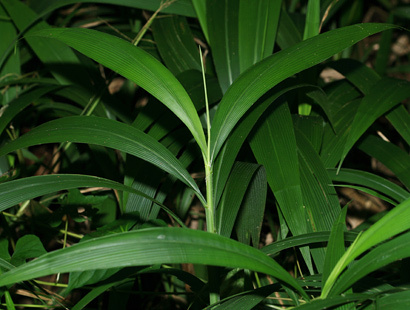 This naturalized plant is native to tropical Africa, Asia, and the South Pacific. 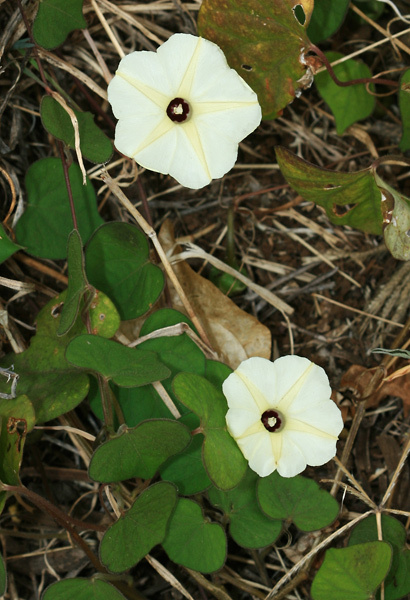 Description: The funnel-shaped, solitary or grouped flowers are white or pale yellow with a darker yellow 5-pointed star shape and have a dark purple throat and 5 green, hairless to lightly hairy, egg-shaped sepals. 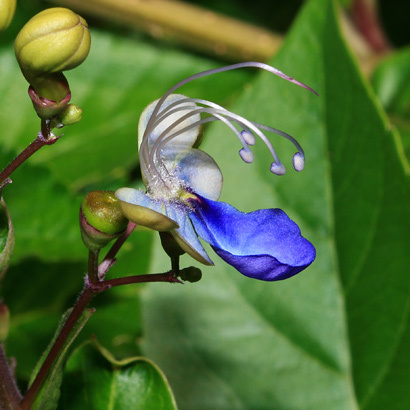 The flowers are followed by rounded, hairless, point-tipped seed capsules with reflexed sepals. 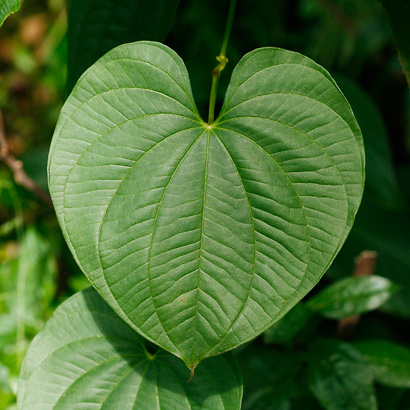 The leaves are green, alternate, hairless to sparsely hairy, and either heart-shaped or oval-shaped. 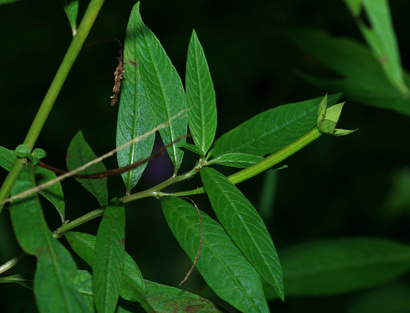 The stems are slender, twining or trailing, and almost hairless to sometime hairy. 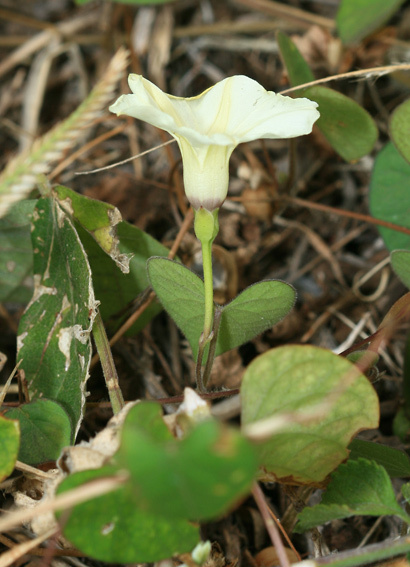 Here in Hawaii, Obscure Morning-glory is weedy and grows in dry, open, disturbed areas at low elevations.